Welcome to the second installment of our Insider’s Guide to the ResAll Poststaurants of Todos Santos! Here we present the town’s Killer Local Joints and Taco Stands. This guide is divided into 7 categories, with restaurants presented in alphabetical order within each category. The sample menus shown with each restaurant are literally just a snapshot from our last visit; menu options and prices may naturally evolve over time. Please check out our other categories including: Great Food, Great Chefs, Great Atmosphere; Wonderful Food in a Beautiful Garden Setting, Charming Cafes with Great Breakfasts – and More! ; Healthy Fare; Fun Places with Cute Atmosphere, Live Music, Live Theater, Live TV! ; Pizza and Burgers Buen Provecho! Overview: Tamales are ubiquitous in mainland Mexico, but it was almost impossible to find a fresh, hot, tasty tamale in Baja (or at least in Todos Santos) until Alma opened her street-side stand in early 2013. Folks here literally couldn’t get enough – if you arrived too late in the day she was inevitably sold out. Based on that success, Alma and her husband Manny have since upgraded to a cute open-air restaurant that is a favorite with locals, Mexicans and gringos alike. In addition to their fabulous selection of chicken, pork, beef, chile, pineapple and mixed tamales, Alma and Manny also serve an assortment of traditional Mexican fare for breakfast, lunch and dinner including chilaquiles, sopas, tortas, tacos and pozoles. And they are now almost as famous for their chiles rellenos as for their tamales, and they’ll stuff them with pretty much whatever strikes your fancy. Delicious all around! Service: They serve great food! (with a smile). Some English. Lots of people really enjoy the budgies they have in the dining area. Hours: 9:00 AM – 9:00 PM daily, unless they’re closed. Contact: On Marquez de Leon at the corner of Colegio Militar. Overview: One day Alma, the owner of the fish store in town (no relation to Tamale Alma), woke up and realized that there probably wasn’t anyone in town better qualified to open a seafood restaurant than her; so much to our joy and delight – she did! The result is a completely delicious array of seafood dishes served up on a collection of plastic tables under an awning next to the fish store. It’s a wonderful addition to the lunch scene in Todos Santos. Service: Very pleasant and efficient. Hours: 11:00 AM – 5:00 PM daily. Closed Sundays and Mondays. Overview: Raul Lopez moved to Todos Santos from Michoacan about 5 years ago to open Carnitas Uruapan, and he’s been serving up delicious, traditional Mexican food ever since. 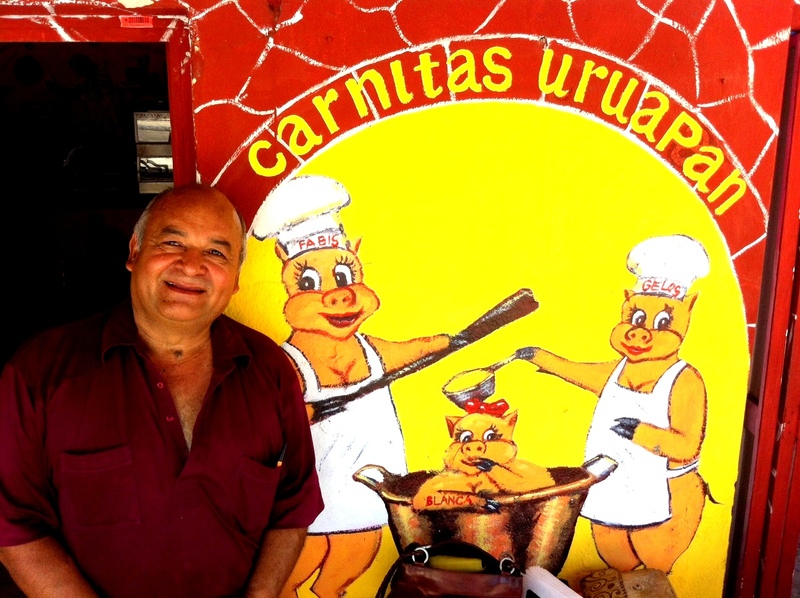 His carnitas are famous for being marinated, not fried – and oh so tasty. The walls of this simple, comfortable restaurant are all decorated with original artwork by Juan Manuel Su, and enjoying these murals is almost half the fun of eating here. Not to be Missed: Chiles rellenos, chilaquiles (great red sauce), and all the breakfast egg dishes. Rating: Great! Wildly delicious food at very tame prices. Overview: Todos Santos local Salvador Chavez and his wife Thelma started this little road-side café in 2009 and have been serving up unbelievably delicious ceviche and other seafood dishes ever since. Very simple outdoor dining on plastic tables under a palapa roof. Very popular with locals and expatriots alike. Service: Efficient! A bit of English. Rating: We love it! We take some of our groups here for lunch and also meet our friends here regularly. Hours: 9:30 AM – 7:00 PM every day but Wednesday. Overview: If you’re a meat eater get yourself over to this taco joint and order up some Tacos Al Pastor now –it’s one of the best tacos you’re ever likely to consume in this life. El Pastorcito is so popular that it recently moved to a new, larger location closer to the center of town. The 2 Lucias who run El Pastorcito have been offered significant sums of money to reveal the secrets of their tacos al pastor, but they’re not selling or telling. For vegetarians El Pastorcito also serves papas rellenos and quesadillas. Beer, soft drinks and water are for sale. El Pastorcito was started in 2007 by Alejandro Fuerte, a 20-year resident of Todos Santos who moved here from Michoacan. Service: Nice folks serving up great food. Limited English. Rating: Absolutely awesome! We eat here as often as possible. Hours: 8:00 AM – 2:00 AM daily. Except when they’re closed. Overview: Looking for a more peaceful environment, Jose Luis Ibarra Grimaldi, his wife Maria and their children moved to Todos Santos from Mazatlan five years ago and have been delighting Todos Santos taco lovers ever since. El Sinaloense serves a variety of seafood and meat tacos, papas rellenos and quesadillas during the day, and a variety of seafood dishes at night. Soft drinks, orchata and water available. Hours: 7:00 AM – 2:00 AM every day except Monday. Overview: Las Fuentes is a very charming restaurant that has been serving up a wide range of delicious Mexican breakfast, lunch and dinner dishes since 1994. The name of the restaurant comes from the traditional fountain (fuente) under the large palapa roof. Seating available under the palapa and in the garden. Overview: Started in 2001 by Miguel Angel Torres Villalobos, Miguel’s is another great Todos Santos institution. Originally famous only for its chiles rellenos – and rightly so – Miguel’s has really increased the quality of its other offerings and now serves a full menu of very tasty, very well-prepared, traditional Mexican dishes. They also offer breakfast now. Miguel’s has a very cute atmosphere with stones on the floor, surfboards on the ceiling and plenty of cold beer and margaritas in the kitchen to serve all comers. It’s the epitome of Baja! Service: They’re on the job! Rating: A favorite! We take almost all of our groups here for either lunch or dinner during their stay with us. Hours: 8:00 AM to 9:00 PM daily. Closed Wednesdays in the summer. Overview: This taco joint on the side of the road is a celebration of Baja California Sur’s great contribution to Mexican cuisine – the fish taco! Started 13 years ago by the original “George” Jorge Ramirez Rodriguez of La Paz, it is now run by George Jr. who moved to Todos Santos 3 years ago to take over management of the stand from his father. 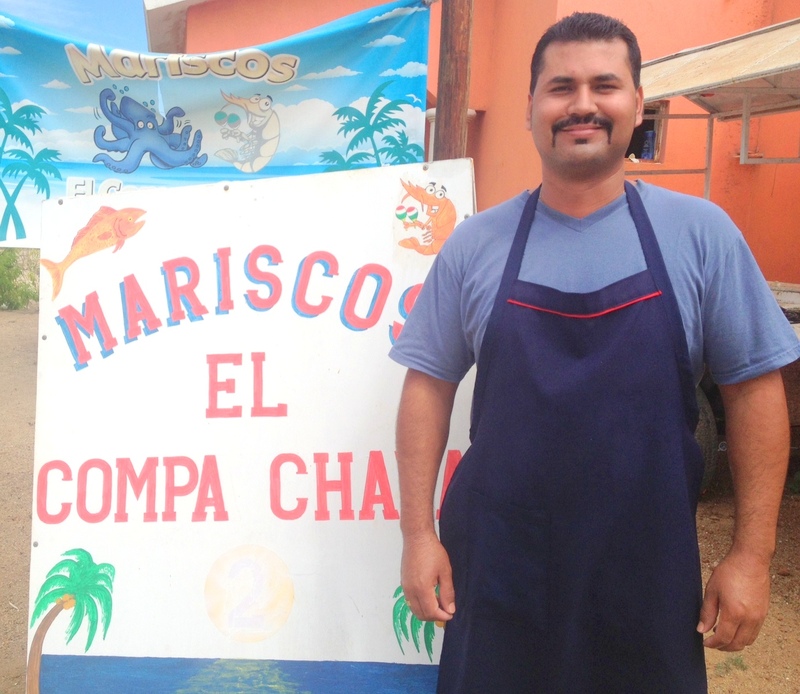 George buys his fish from the local fishermen at Punta Lobos and is proud to be serving a Todos Santos-sourced meal. Soft drinks available for sale. There are usually a couple of plastic tables with chairs next to the cart for those who would prefer to dine en scene. Not be be Missed: Fish tacos! Service: They get the tacos from the cart to your mouth as quickly as they can! Rating: YES!! Great fish tacos! We eat here as often as our cholesterol counts allow. Hours: 9:00 AM – 3:00 PM daily except Thursday. Sadly, I’ve only eaten at two of these establishments … but that just means I have seven more reasons to come visit! Thanks for introducing me to the local fare! any chance you have the contact for Tequila Sunrise? I have heard they serve killer Margaritas and delicious food. This entry was posted on August 6, 2012 by Todos Santos Eco Adventures in Culture, Food, Travel Industry and tagged Alma y Manny, Bahia Restaurant Bar, Barajas Tacos, Carnitas Uruapan, Compa Chava's, Dining in Todos Santos, El Pastorcito, El Sinoloense, Las Fuentes Restaurant, Miguel's Restaurant, Taco George's, Todos Santos restaurants, Todos Santos taco stands.